It's official: The bill re-naming NASA's Hugh L. Dryden Flight Research Center in southern California for the first man to walk on the moon is now a law. President Barack Obama signed congressional resolution HR 667 into law on Jan. 16, renaming the flight facility the Neil A. Armstrong Flight Research Center. The new law still pays homage to Dryden — an aeronautical engineer — by naming the area surrounding the center the "Hugh L. Dryden Aeronautical Test Range." "Both Hugh Dryden and Neil Armstrong are aerospace pioneers whose contributions are historic to NASA and the nation as a whole," NASA officials wrote in an announcement. "NASA is developing a timeline to implement the name change." You can watch a video of Armstrong's at the flight center. The U.S. Senate passed the renaming bill on Jan. 8, and before that, the U.S. House of Representatives passed a corresponding resolution in February 2013. This is at least the third time since 2007 that Congress has tried to re-name the facility for Neil Armstrong. Armstrong died at age 82 on Aug. 25, 2012. Before becoming an astronaut and walking on the moon in 1969 as commander of NASA's Apollo 11 mission, Armstrong was a research pilot at the center that is now named for him. 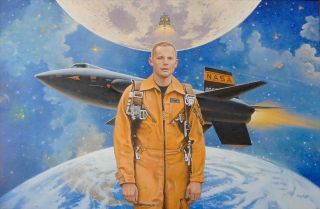 "Armstrong racked up over 2,450 flying hours, serving as a project pilot on several test planes, including the X-15 rocket plane," NASA officials wrote of the famed astronaut's work at the center.